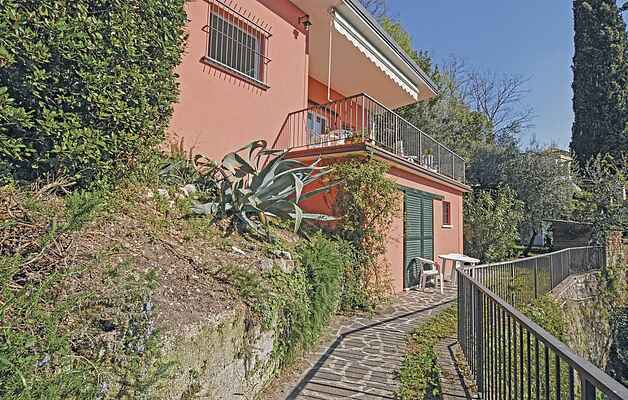 This pretty, secluded holiday home with a huge terrace that offers view of the lake is just 500 metres from the lake and the centre of Gargnano. This home is situated in a residence with several other independent holiday homes that are accessible only on foot via internal roads. A parking area is 100 metres away from the houses. This holiday home has two floors, ground floor and basement. Through a private gate and a staircase, you can reach the lake, the beaches and the old town of Gargnano (150 metres away). The garden in this home is secured with a small gate and a part of the garden is shared with the other house. A bright living room with dining room and kitchen, a bedroom with double bed, bedroom with two single beds and a bathroom with shower are on the ground floor. A small living room with sofa bed and bathroom with shower are in the basement. The huge outdoor area provides a panoramic view of the typical vegetation and the lake. The location is ideal to visit the towns of Gargnano (old town and lake boardwalk) or Toscolano Maderno (4.9 km) with its panoramic trails. The picturesque villages of the lake are reachable by boats (just 500 metres away). For sports enthusiasts, there are various options such as canoeing, sailing, windsurfing, fishing, diving, tennis (in just 100 metres), trekking and mountain biking as well as horse-riding. Nature parks and water parks that offer fun for people of all ages, are located nearby. Art lovers can visit Vittoriale in Gardone Riviera and the new museum of Salo (MU.SA. ).